You’d think getting sent to Turning Pines Wilderness Camp for a month long rehabilitation 'retreat' and being forced to re-live it in this journal would be the worst thing that’s ever happened to me. But there’s this guy here. Ben. And the more I swear he won’t, he can’t, the deeper under my skin he’s getting. After the thing that happened, I promised I’d never fall for another boy’s lies. And yet I can’t help but wonder… What if? Cassie is an angry young lady. Angry with her life, angry at her sentencing but most of all, angry with herself. When she is caught and charged with possession, her friends threw her to the wolves. But there is more to Cassie's secret than a little recreational drug use. She has 30 days to reflect on what she's done and to think about her future beyond the camp. Ben is cheeky, mischievous and Cassie has vowed never to fall for another line, to show vulnerability or let anyone touch her. With a strong dislike, boarding on hatred relationship with her promiscuous dorm mate, trying to make sense of her one camp friend, who turns out is a self imposed mute, the camp seems like a complete waste of time. Cassie is taught survival skills, for all those 'just incase' situations she may stumble across. Getting eaten by a bear, needing to start a fire from nothing more than twigs and expressing herself in a journal of reflection. Cassie has emotionally shut down, she refuses to acknowledge Aaron, the boy who seemingly kicked off her issues that lead to her journey to Turning Pines. Cassie, with only her brother for moral support at home, starts to slowly let her guard down. As Cassie struggles with her inner demons, she starts to fear returning home. Going back to her life in a part time job in a pizzeria, her alcoholic mother and father and brother in the armed forces. She's scared to leave the camp and how every activity, each lesson learned is just another step in her journey to stop her self hatred and begin to heal. Most of all, shes scared of walking away from the boy who makes her feel as though she could be happy again. I thoroughly enjoyed Dear Cassie, the companion novel to Pretty Amy. 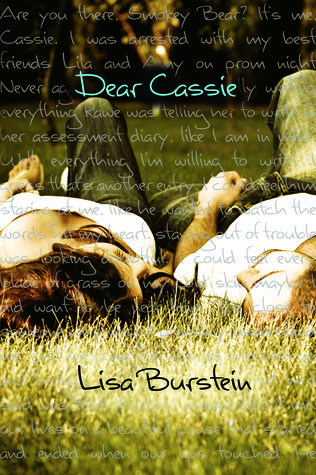 The story is told through Cassie's reflection journal, her inner most fears and self hatred. It's in between the young and new adult genres, as Cassie subtly self harms, commonly uses F*@K in most of her sentences (not uncommon for most teens) and it deals also with darker issues that can be confronting.The growing friendship between Cassie and Ben is surprisingly gentle and sweet.